Dorothy Martin’s backyard is a songbird’s paradise. If a cardinal or blue jay is thirsty in the winter, it can perch on a heated birdbath and dip its beak in. And no feathered visitor ever needs to leave the yard hungry, as Martin has a whole village of feeders full of the birds’ favorite meals. 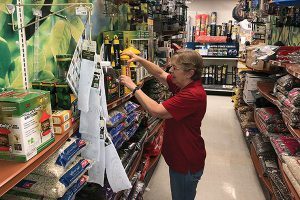 As the head of the lawn and garden department at Rocking R Hardware in Harrisonburg, Virginia, Martin is a resource her customers can turn to. She has been a bird enthusiast for more than 30 years. No matter where you are in the country or what your customer demographics may be, you likely have customers who enjoy bird-related activities, too. Whether customers are casual about their interest or consider themselves serious birders, the niche can be successful in nearly any market. 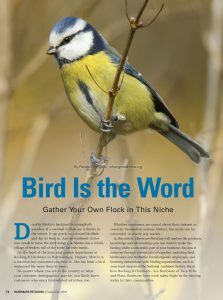 In this article, Hardware Retailing will explore the products, knowledge and relationships you can build to make the birding niche a successful part of your business. Success is achieved through a broad mix of supplies, including feed, birdhouses and birdbaths; knowledgeable employees; and fostering connections with birding organizations, such as your local chapter of the National Audubon Society. 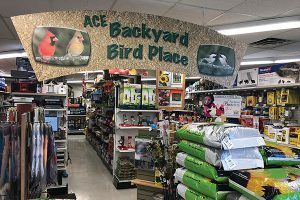 Read how Rocking R Hardware, Ace Hardware of Toco Hills and Plain Hardware have each taken flight in the birding niche in their communities. Customers at Rocking R Hardware in Harrisonburg, Virginia, are easily drawn to the birding department. 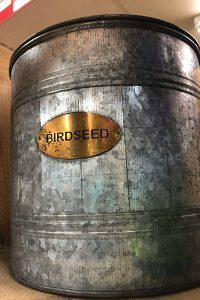 In addition to utilizing large signage and stack outs for bird seed and other related products, it even has a musical track with bird songs playing in the background. Whether you already have a designated area for birding products in your store, finding the right products and displaying them in a memorable way can help spread the word about the department to other birding enthusiasts. In the six years since Tom Pate became owner of Ace Hardware of Toco Hills in Atlanta, he has seen the birding niche become one of the best performing departments in his store, based on sheer volume of sales and high margins. 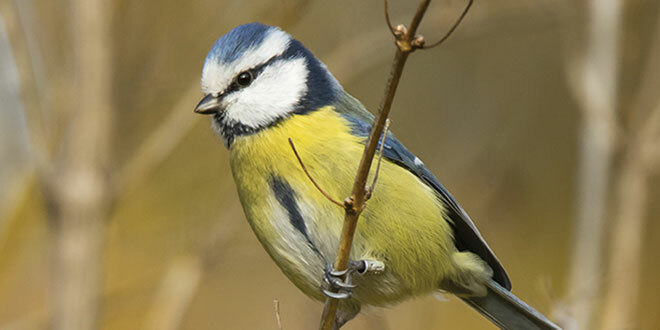 The store sells a wide variety of bird products, but the most profitable and important to consider is stocking a wide variety of bird food, Pate says. 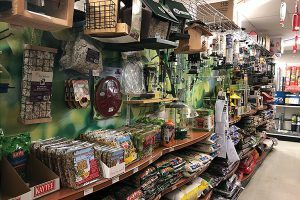 At Rocking R Hardware, the business now is home to two 30-foot sections of bird products, including feeders, houses and food, Martin says. Some of the most innovative products in the category that Martin sells include bird feeders that detect the weight of larger animals, like squirrels attempting to eat from the feeder, as well as heated birdbaths for cold winter months. Rob Whitten, owner of the store. And although birding has a reputation as a pastime mostly popular among older generations, Pate says his store serves a wide customer demographic. Dorothy Martin, head of the lawn and garden department at Rocking R Hardware and an avid birder, is a resource for her customers. Many customers want to be specific about the birds they attract. Martin suggests doing some research on what birds customers might be looking for and the food they prefer. “I have been bird-watching for many years, and I use many of the products we sell at my own home, so it makes it easier to share my knowledge and experiences with our customers when they’re trying to find the right feeder or food to attract specific birds,” Martin says. For example, Rocking R Hardware sells a book that categorizes the birds of the state of Virginia by color. If Martin isn’t sure what type of bird a customer is trying to describe, she can look for a specific color and help them identify the type of bird, what it eats and what habitat it prefers. Pate says having an interest in the hobby and trying products at home has established himself and his employees as helpful resources for customers. Another resource you can utilize to educate yourself is the National Audubon Society. The organization protects birds and the outdoor spaces they rely on now and in the future, says John Rowden, the National Audubon Society’s director of community conservation. The nonprofit conservation organization has state programs, nature centers, local chapters and can be a great resource for partnerships. 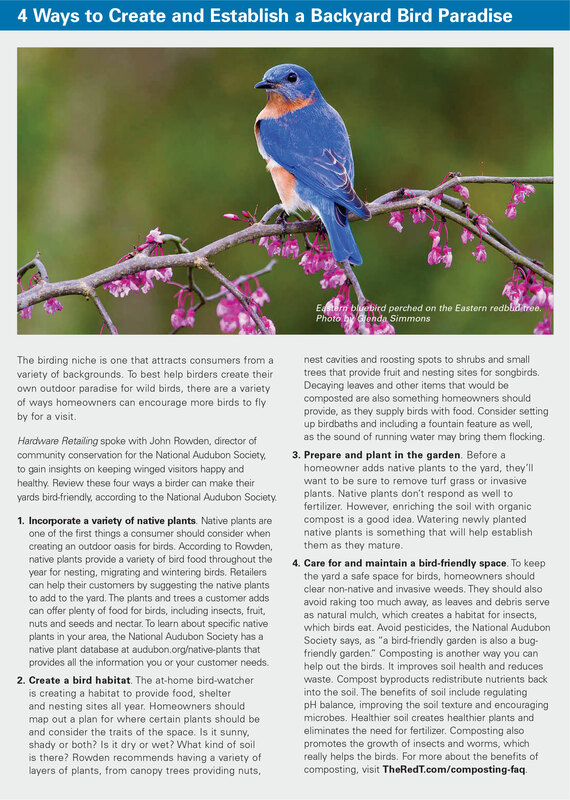 Rowden also suggests retailers focus on selling native plants and provide a combination of both bird-specific products and lawn and garden products. In addition to offering native plants, he suggests offering bird seeds that are nutritionally complete without added fatty ingredients. To grow an audience of repeat birding shoppers, display a variety of bird foods, houses and feeders for visual impact. To help reinforce your reputation as a place with a strong birding niche, you should also consider hosting events for customers who are bird enthusiasts. Rocking R Hardware has hosted events to draw bird lovers into the store. The store’s most popular events included partnering with a local wildlife center to show living wild birds, Martin says. 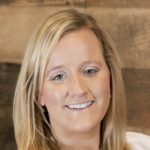 Plain Hardware also hosts events to help build connections within its community, says Whitten. “In addition to offering the products and materials a customer will need to attract birds, we encourage our customers to learn through educational events by providing access to local experts and enthusiasts,” Whitten says. Recently, the store partnered with a biologist, naturalist and educator from the area, Susan Ballinger, to take a group on a day trip to learn about birds and how to identify them int he field. For the bird-watching outing, Ballinger brought several items to share with attendees that you might consider if you host a similar event. Plain Hardware offers many unique bird-themed items, like this decorative birdseed container. Ballinger brought special shirts that protect people from mosquitoes, as well as extra binoculars and books to help attendees identify types of birds they might see. The attendees started at the store and visited a few popular riverside bird-watching spots. As an expert birder, Ballinger was able to offer event attendees insight on how to be a more knowledgeable, serious hobbyist. Learn more about the bird-watching event that was hosted by Plain Hardware and led by Susan Ballinger. In the article, Ballinger shares advice from the perspective of a serious birder and discusses what items a store should carry if they want to attract bird-enthusiasts like herself. According to Whitten, his focus within the birding niche is to offer useful knowledge and education, the products and materials a customer needs, and access to local enthusiasts and experts through events.